Noting that “in 2017 the United States spent $610 billion on its military, more than two and a half times as much as China and Russia combined, amounting to 35% of world military spending”, and that this huge amount is slated to rise significantly in coming years ”the USCM “calls on the President and Congress to reverse federal spending priorities and to redirect funds currently allocated to nuclear weapons and unwarranted military spending to support safe and resilient cities” and to meet basic human needs. The USCM resolution expresses deep regret that the United States and the eight other nuclear-armed states boycotted last year’s negotiations for a Treaty on the Prohibition of Nuclear Weapons (TPNW) and urges the U.S. government to “embrace the TPNW as a welcome step towards negotiation of a comprehensive agreement on the achievement and permanent maintenance of a world free of nuclear arms”. The resolution was sponsored by Mayors for Peace U.S. Vice-President T.M. Franklin Cownie, Mayor of Des Moines, Iowa and 25 co-sponsors including USCM President Steve Benjamin, Mayor of Columbia, South Carolina and USCM International Affairs Committee Chair Nan Whaley, Mayor of Dayton, Ohio. The USCM, the nonpartisan association of 1,408 American cities with populations over 30,000, has unanimously adopted Mayors for Peace resolutions for 13 consecutive years. Resolutions adopted at annual meetings become USCM official policy. As noted in this year’s resolution, “Mayors for Peace, which is working for a world without nuclear weapons and safe and resilient cities as essential measures for the realization of lasting world peace, has grown to 7,578 cities in 163 countries and regions, with 213 U.S. members, representing in total over one billion people”. 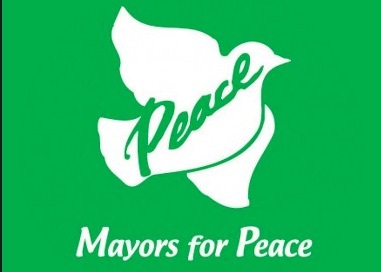 Mayors for Peace, founded in 1982, is led by the Mayors of Hiroshima and Nagasaki.